The rain gutters around your house serve the important purpose of carrying rain away from the structure and foundation of your home. When rain gutters do not properly drain, the water backs up and goes over the front and back of the gutter. Clogged gutters cause the water to flow over the front and back of the gutter. This can cause damage and water accumulation next to the foundation of the building. The water going over the back can cause damage to the wood behind the gutter. Seriously clogged rain gutters can become full of water and wet leaves, weighing as much as 50 pounds or more per 10-foot section. Water can pool along the eve of the roof causing damage to the roofing material and underlying wood. The extra weight can even cause the gutters to separate from the building causing even more damage. Rain gutters that are even just partially blocked become excellent growing places for weeds and other undesireable plants. With a constant supply of water and fresh debris (old leaves, etc. 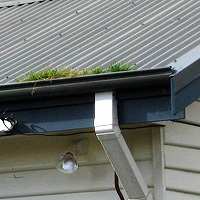 ), plants can start growing in the rain gutters. This causes corrosion and extra weight, and prevents the rain gutter from functioning normally. Regular gutter cleaning is sensible and affordable! Why not let our trained staff take care of your gutter cleaning needs! We clean gutters professionally. We clean out all the leaves, pine needles, sticks and other foreign objects from your gutters. And we remove the stuck leaves and gutter sludge (build-up of decomposed debris combined with particles from the roof that sticks to the bottom of gutters). We really clean your gutters so they flow freely! We check each and every downspout. A common place for gutters to become clogged is at the elbows of the downspouts. The gutter itself may be clear, but often times debris and sludge have collected in the elbow and can't be seen. When we finish cleaning your gutters, water will be able to pass through every channel and downspout freely! Our prices are competitive and affordable. Give us a call at 678 648 2698 or email us for a prompt estimate with no obligation.